A guest appearance by both, Sridevi and Sunny Deol looked gorgeous in the 1980s together - even though they famously did not get along too well. Both introverts and shy, Deol did not care for his leading ladies taking over a film, which powerhouse Sri did more of ten than not. 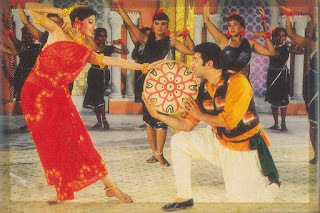 Their box office power meant that they were used greatly in the publicity of the... sorry to say, awful film Main Tera Dushman (1989). Tried to watch it recently but couldn't finish it - the two are fun to watch in the songs though.